- It is 100% Natural & Pure. This cucumber-like fruit with ugly bumps all over it is popular due to its various health benefits, its benefits notwithstanding. We manufacture, export and supply a high quality of dry chutney powders. quality raw materials used, finely hand graded and roasted carefully to make good quality od blended powders with good aroma and taste. Add ghee or oil with this Bitter Gourd Spice Powder and mix with hot plain rice. Owing to the efforts of our skilled professionals, we have been constantly engaged in offering a qualitative assortment of Bitter Gourd Powder. As we have an efficient supply chain network, our company is able to fulfill bulk orders with ease and make deliveries on time. 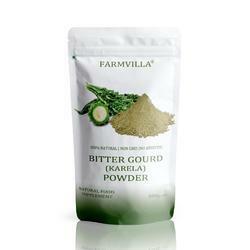 The Bitter Gourd Powder, delivered by us, is largely appreciated for its taste and flavour. Karela is a blood purifier, activates spleen and liver. Can be mixed with soups and gravies. Karela is known to be highly beneficial for diabetics. Bitter melon or karela has been used in various Asian and African traditional medicine systems for a long time.